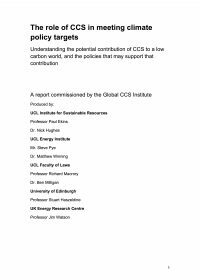 A diverse group of organisations from industry, government, and the environmental community jointly sponsored Industrial Economics (IEc), an expert in environmental economics and natural resource damage assessment, to develop and test a model approach for valuing the economic damages arising from a well-sited and well-managed CCS project. These damages included environmental and human health impacts arising from a range of potential events such as pipeline ruptures and subsurface leakage. They do not address potential impacts from facility construction or routine operation, nor do they address potential impacts to workers, business interruption, facility repair or similar ‘private’ costs internal to the operator. The model was successfully developed and applied to a ‘realistic’ project based on the publicly available risk assessment for a site from the FutureGen 1.0 site selection process. The project was planned to inject 50 million metric tons of CO2 over 50 years and to have a 50 year post-injection period (for a 100-year analysis period). This site-specific application of the model showed that the ‘most likely’ (50th percentile) estimated damages arising from CO2 totalled approximately $7.3 million and ‘upper end’ (95th percentile) estimated damages totalled approximately $16.9 million. On a per metric ton basis, these results translate into ‘most likely’ (50th percentile) estimated damages of $0.15 per metric ton and ‘upper end’ (95th percentile) estimated damages of $0.34 per metric ton. When combined, the estimated damages for CO2 and H2S were roughly 10-15 per cent higher. It is important to note that the range of damage estimates is highly sensitive to site-specific data. The sponsor group concludes that the tools exist to estimate prospective financial damages. Further, the sponsor group has developed insight into the magnitude and timing of dollar amounts that are likely to be at risk and the conditions under which they may be at risk at a well-selected and well-managed CCS project. This analytic approach is based on generally accepted practices within the financial and insurance industries, and can be applied, with adjustment for location, to CCS projects around the world. Earlier studies by IEA GHG had shown that of the main geological storage reservoirs available globally for CO2 storage, deep saline aquifers have the highest storage potential and substantial cuts in CO2 emissions may therefore require utilisation of deep saline aquifers as storage reservoirs. However, the storage capacity of deep saline aquifers from various estimates show wide bounds: from 1,000 to over 10,000 GtCO2 globally. Many of the deep saline aquifers being considered for storage are ‘virgin’ formations and structures in which little or no geological characterisation has taken place, in contrast to many oil and gas fields. Therefore, considerable exploratory work will be required before such structures can be considered as “fit for purpose” for CO2 storage. Selection of safe and secure geological reservoirs must be accompanied by confidence in the associated CO2 storage capacities. The aim of this study was to bring together and review the research that has been undertaken in Europe, North America, Japan and Australia, to develop an understanding of how knowledge on deep saline aquifers has developed in recent years, in particular since the 2005 IPCC Special Report on CO2 Capture and Storage (IPCC SRCCS). Emphasis was placed on the identification of knowledge gaps and priority areas for R&D activities.